Philadelphia, PA, USA; Columbus Blue Jackets goalie Curtis McElhinney (31) makes a save against the Philadelphia Flyers during the third period at Wells Fargo Center. The Flyers defeated the Blue Jackets, 5-4. In addition to being the youngest team in the NHL, Columbus has been bitten by the injury bug on a seemingly nightly basis. Just in the last eight days, the list of the walking wounded grew, shrank and then grew again. It’s almost as if there’s a revolving door to the trainers’ room. Jared Boll had surgery to repair a torn ankle tendon last Monday and remains on IR. He’s expected to miss the next three to four months. Derek MacKenzie (lower body) and Dalton Prout (upper body) were injured in the game against the Winnipeg Jets last Monday, with Prout being placed on Injured Reserve and expected to be out two to three weeks. MacKenzie was expected to miss a similar amount of time. Marian Gaborik and James Wisniewski were on IR before both being activated on Friday. Gaborik skated just four shifts before suffering a broken collarbone and going back on IR for what is expected to be out six to eight weeks. Nathan Horton has yet to play a game for the Union Blue after offseason shoulder surgery. Vezina-winning goaltender Sergei Bobrovsky, injured in the game against the Tampa Bay Lightning, went on IR on December 4th (groin strain). Although he’s skating on his own, he is still expected to be out until after the first of January. Speculation on Matt Calvert, after he sustained an upper body injury in the game against the Flyers Saturday night, is that he’ll be out for two to three weeks. "I’ve never been a part of a team that (this many) injuries, with guys going down," said Columbus head coach Todd Richards. "Losing two guys in the Winnipeg game, getting two guys back, then two other guys are knocked out. It’s the length of some of these injuries, too. No, I’ve never been a part of it." But, there is some good news amidst all these injuries. Both MacKenzie and Jack Skille, who hurt his hand blocking a shot Thursday in Philadelphia, are expected to be in the lineup tonight. And Horton is oh-so-close to making his debut sometime after the Christmas break. A quiet source of solid goaltending has been Curtis McElhinney. He started the season as the clear backup to Bobrovsky before being thrust into the starting role when Bobrovsky was injured. The team plays just as confidently in front of him as they do when Bobrovsky is between the pipes. He rarely looks flustered and doesn’t let in many "bad" goals. Against the Flyers on Saturday, "Curtis made some great saves, timely saves," said Richards. "Curtis made one great save down at our end of the ice. It looked like an empty net. It looked like he reached out with his glove and got a piece of the puck and kept it out of the net. And we ended up going down the ice and scoring." He’s a somewhat quiet man of 30 who has an air of calmness around him. He has a .920 save percentage and a GAA of 2.56 in 14 appearances for Columbus. He acknowledges that the Thursday game in Philadelphia was "bizarre." That meltdown opened the eyes of many players and they played a much better game in front of him Saturday. "I think the big thing with us after that Thursday game," said McElhinney, "was that we just wanted a little more structure in our game. We didn’t want to be running around. We certainly limited their skill players and did a pretty good job (against them). It’s a big win for us, really big." 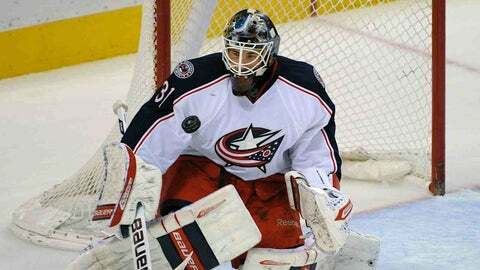 McElhinney and the club are in the midst of five games in a row against divisional opponents. They are getting back to the collective mentality of each game being the most important game of the season. He’s no different in the way that he approaches each game. "I know we’re not even halfway through the season yet," he said, "but you still look at it and say ‘okay, we’re thirty-some games in here, we need to start establishing ourselves, not only within the division, but the conference, as well’. We need to get above .500 and move on from there. Obviously, we have a lot of big games before the year is out. They are all important (games). They’ll certainly be tough, I know." Every goalie in the NHL wants to be "the guy," the number one starter for their team. McElhinney is no different in that regard. He’s doing the best he can to give the team a chance to win every night with the knowledge that he’s an unrestricted free agent next summer. More so than wins and losses, it’s how he plays the game that will determine what becomes of him next summer. "If a team is fortunate enough to have a ‘1A, 1B’ situation, all the power to them," he said. "It’s a tough thing to keep around, especially when guys play well. If this leads to an opportunity to become a number one, then yes, I’d certainly want that chance. I mean, that’s the ultimate goal and it always was. For the time being (with Bobrovsky injured), I am the number one. So, it’s important that I step up when Bob’s out and give this team an opportunity to win." Columbus has become more consistent in the way they’re playing the game and it has unfolded in front of McElhinney. "(Early in the season) our game was changing on a game to game basis. Right now, we’re looking for a little more consistency. We’ve had some ups and downs, but for the most part over the last 10 or 15 games, we’ve been a lot more solid than our start was." With the rollercoaster ride that was the start to the Blue Jackets season, he doesn’t seem surprised that they’re sitting a mere three points out a guaranteed playoff spot in the Metro Division. "You look at it (standings) and say ‘well, we’re fortunate’. It wasn’t the start (to the season) that we anticipated." "The nice thing about that is that you’re not too far off the race. You’re still in the hunt. It’s important that we get on a roll here, stay with the rest of the pack and keep pushing forward." Every game is important to the club, and according to the players, none more so than the game they’re playing. With a win in Raleigh tonight, Columbus can draw even on points with Carolina and inch that much closer to the upper reaches of the division. The puck drops at 7 p.m.